History: Cultivation of vines in La Mancha reached its maximum expansion as of the year 1940, due to the implantation of numerous wine cooperatives throughout the region. 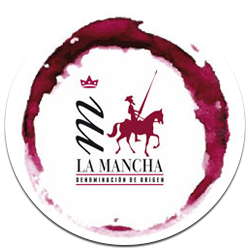 Vine growing is also the main economic activity of the municipalities that make up the La Mancha Designation of Origin. Geography and soil: This is the largest vine-growing area in the world, hence it is known as “The Winery of Europe”. It covers 193,133 hectares, divided into four provinces (Albacete, Ciudad Real, Cuenca and Toledo). In total it includes 182 municipalities and 300 wineries. The terrain relentlessly clambers up from north to south. The great extension of relief tends to be flat and the height above sea level stands at about 700 metres. The soil is calcareous, quite frequently reddish in colour and poor in organic matter. Climate: The climate is continental, with extreme temperatures, ranging between -15º in the cold winters and 45º during the torridly hot summers. Drought is another of its most remarkable characteristics, with scarce rainfall (300 to 400 mm/year). On the other hand our land is exposed to 3000 hours of sunlight per year, hence turning its grapes into pure gold and offering us its very best fruit. Varieties: The Airén grape variety continues to be the most extensive, although Tempranillo is the one that has increased the most, already exceeding a figure of 18,300 hectares, and given the impressive restructuring of the vineyard in the region, it is foreseen that this figure will continue to increase in the coming years. Also and precisely due to this restructuring, in the last few years other varieties that are increasingly more extended in the Designation have also been planted.